Grazie Mille il mio insegnante! Thank you my teacher! Un abbracione! Big hug! Antonio, you have written several books now. I own 4 of them myself. The first book I purchased is entitled I Segreti della Lingua Italiana per Stranieri, The secrets of the Italian Language. You take a unique approach in this book. Can you share with me what this method is all about and how your method progressed? 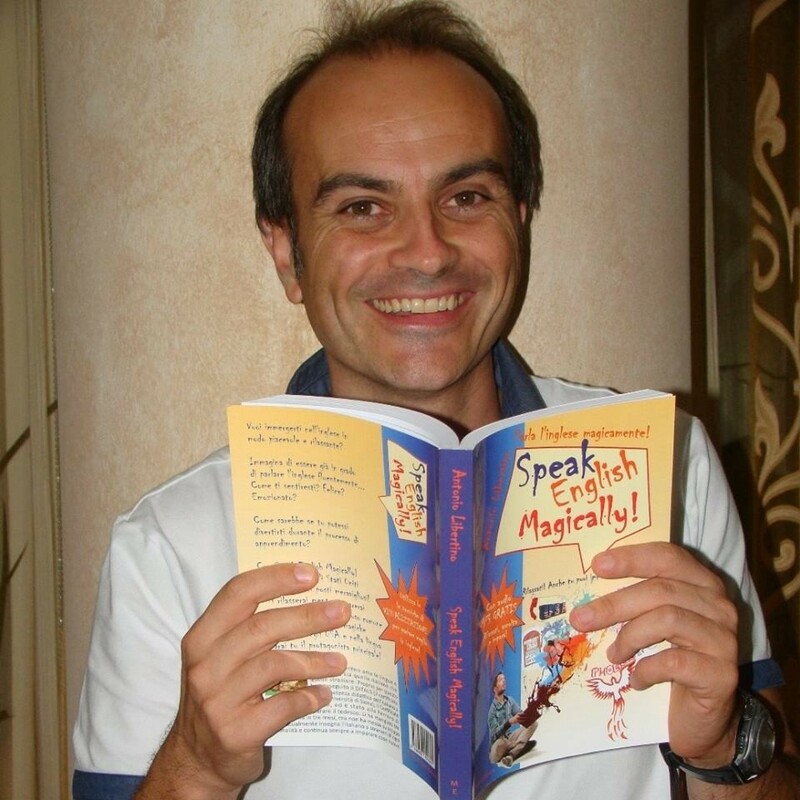 My idea was to teach Italian and tricks to learn it faster directly in Italian, both in writing and in audio. How could I make it possible even for people who aren't able to understand my own language yet? I added English translations in that book, so that anyone can read it. If you are very good at the language, you can just listen to it and take it as a refresher course. If you are just curious about the language and you are an absolute beginner, you can begin by reading it in English; then read it again in Italian, experiencing the pleasure of understanding it. That book and its sequel (More Secrets of the Italian Language) are just my incursion into a multilayered approach to let people learn and acquire Italian in the easiest way I could think of at that time.Then I started exploring the field of guided imagery in language learning for which a good entry point is my Speak Italian Magically book (which I recently updated and rewrote so that it also became a course of English for Italians). If you want to know more about this, you can watch me while introducing the subject at the 2015 Polyglot Gathering in Berlin. I know you speak English and German as well as your native Italian. How has learning more than one language enriched your life? It has enriched my life a lot! Absolutely! Thanks to English and German I could experience what I couldn't have experienced if I wasn't able to speak those languages. I am also passionate about learning (anything!) and sometimes I realize that if I want to know more about a specific subject I have to read it in English or in German.Speaking a different language also helps me understand more about the people I get in touch with. After all, I truly believe what Nelson Mandela said: "If you talk to a man in a language he understands, that goes to his head. If you talk to him in his language, that goes to his heart." Do you have suggestions for people like me who do not use their second language very much--how can I keep from losing it? The first piece of advice that comes to my mind is this: do something that you really enjoy, and do it in Italian. Besides spending time with the ones you love- which is great! - what's the thing that you really love doing almost every day? Could you divide it into a little time span experience and still enjoy it?Let's assume that you really love walking in the nature every day. Could you do it in Italian for a few minutes? I mean, are you able to name the things that you see, hear, feel, smell or taste in Italian for those few minutes you want to enjoy walking? If so, great: that was a great refresher course! If not, it just means you need to take a mental (audio, written) note about it and look the words and expressions up! In this second case you created your own Italian mini course! And this builds up your motivation, because you are growing the vocabulary that really matters for you! Great Idea Antonio! Thank you. I will do it. What is it about Italy and Italians that people around the world find so fascinating? What does Calabria have to offer to travelers like me? Well! The first question is a one million euro question, because there may be some common answers to this question (art, beauty, history, culture, for the places; spontaneity, gestures, smiles, for Italians) but deep within anyone who is fascinated by Italy and Italians, there is a unique, personal reason for being in love with Italy and Italians.As far as Calabria is concerned, I am still exploring it. Any time my family and I have the opportunity, we just take our car and go and visit a new place (Sometimes we don't even have a destination.). Lately we have visited Gerace and Stilo and we had new and wonderful experiences suggested by those little places in Calabria. There's still much more to see and experience in Calabria, beside tasty food, traditions, and genuine people. Come and visit! Torno io. Promesso! I will return. I promise! Check out all Antonio Libertino has to offer! More to come in a future blog too.